Jim Carey had a season to remember 20 years ago. Then injuries and a lack of interest killed his career. Two decades ago Jim Carey took the NHL by storm. After an impressive showing the season prior, Carey had a Vezina Trophy-season in 1996 as a 21-year-old. His pro career was short, but it was prosperous. He signed a four-year, $11-million contract, but injuries quickly took their toll. And after stops in Boston and St. Louis, along with a couple stints in the minors, Carey retired from hockey. There was no Hollywood ending to the brief career of the goalie nicknamed ‘Net Detective.’ For a season and a half, however, Carey was brilliant. He was 18-6-3 with a 2.13 goals-against average, .913 save percentage and four shutouts in the lockout-shortened 1994-95 season. He went 35-24-9 with nine shutouts, a 2.26 GAA and .906 SP in 1995-96 to win the Vezina. Ace Ventura: Pet Detective was just out, and they used to play clips during stoppages in play. The fans really got into it in Washington, and the team did a really good job in terms of the production of everything around it. They really marketed him well. OLAF KOLZIG, G: ‘Ace’ was really an easy guy to get along with. He was very easygoing, very laid back. KEITH ALLAIN, GOALIE COACH: He absolutely didn’t come out of nowhere. That may be the perception some people have, but it is not the case. The year before that was the lockout year. He was in contention for major awards in the AHL and the NHL in his first year out of college. He had a great year in Portland. Then when the NHL started up again he came up and played the bulk of the games for us and he was pretty good. KOLZIG: You just sat back in awe watching what he was doing when he first came into the league. I was a first-round pick who was still trying to get some traction as far as a pro career in the NHL was concerned. To see this kid come in and make it look like it was peewee hockey was frustrating for me. TOD BUTTON, ASSISTANT COACH: His Vezina season he came in and was just a very good first-shot goalie. He was big and athletic and filled the net well. DALE HUNTER, C: We played a tight game. ‘Schoeny’ (coach Jim Schoenfeld) believed in blocking shots and playing the right way. Carey had to make the big saves when we needed him, and that’s the reason he won the Vezina. BUTTON: His demeanor on the ice was similar to off it in that he was so calm and poised. It gave the team confidence. Even if he gave up a weak goal, he never got rattled, and in turn the team never did. He had this economy of motion and really understood angles and playing big, well before all these goalie gurus came in and started making it a go-to style. ALLAIN: He was a really nice young man, the kind of guy who stayed to himself, and he was very serious about his game. He thought hard about the position. The goaltending position hadn’t changed yet, either. He was more of a standup guy who was really concerned with his positioning on every shot. He was a stickler for that, and he did a heck of a job controlling rebounds. The puck just stuck to him like Velcro. When he was on there was just never a second shot with Jim. Goalies are known to be cut from a different cloth than skaters, and Carey was no exception. Long before Jonathan Toews became known as ‘Captain Serious,’ there was Carey. JONES: I don’t remember him being an overly superstitious guy, but he wasn’t like Marty Brodeur in that you weren’t talking to him on the day of a game. We let him focus on what he had to do. HUNTER: He was a real quiet guy…a really good guy. We used to go out for meals together. Back when I played with him, he was serious. It was like he was older than he actually was. He was so serious you’d think he was 30, but he was a kid. KOLZIG: We were in the dressing room, and Dale Hunter was sitting across from us on the other side of the room. Dale was 35 at the time, and I remember Ace making a comment that he couldn’t see himself still playing hockey when he got to ‘Hunt’s’ age. Dale would play until they told him he couldn’t anymore. Ace never saw himself doing that. The Capitals won the first two games of the playoffs against Pittsburgh, but Carey didn’t play well and was replaced by Kolzig. Carey went 0-1 with a 6.19 GAA and .744 SP, and Washington lost the series in six games. JONES: When Jim got pulled early in the playoffs it showed that even Schoenfeld was thinking his success wasn’t as much about him as it was the way the team was playing in front of him. That was always the sense we had, and seeing that quick trigger kind of played into the way we were thinking. It all fell apart fast. I think the playoff series against Pittsburgh crushed his spirit. ALLAIN: We were functioning on all cylinders to get the lead in the series, and the Penguins were one of those teams that figured they could ease into the playoffs and then turn it on. We were playing at our highest level, but then they kicked it up a notch, and we didn’t have an answer for that. I don’t think it was a Jim Carey thing. It was the Washington Capitals playing a superior Pittsburgh team. JONES: He had a certain quiet confidence about him that year. Then in the playoffs, we lost against Pittsburgh like we usually did. Mario (Lemieux) and the Penguins lit him up high on his glove side. I don’t know if he was ever the same after that. Carey was traded to Boston the following season, and he went 5-13-0 with the Bruins. He bounced between Boston and AHL Providence the year after that. His final NHL stop came in 1998-99 with the St. Louis Blues. He played three games with them. BUTTON: I was shocked at how quickly it went south for him. I thought we were going to have a long run with him. JONES: I don’t know that he really loved the game. I’d hate to pin somebody with that label, but I remember thinking to myself back then, “I wonder how much he really likes it?” There are some guys that just don’t enjoy it. They’re good at it or even great at it, which makes sense, but at the same time they don’t have much passion for it. KOLZIG: I don’t think becoming an NHL player was something he looked at long term. It was more of a way to make a good salary and be able to set himself up for his post-hockey career. To each their own. I wouldn’t say he lived and died the game. He didn’t eat, sleep and breathe the game. ALLAIN: If you ask me why he didn’t have a long career in hockey, I don’t think he enjoyed it as much as he could have. I think that was the real thing. It’s so hard to play goaltender in the NHL. It’s physically and mentally draining. KOLZIG: Once Ace was out of hockey, he was out of hockey. I don’t think he wanted to interact with it anymore. I don’t think he wanted to answer questions about his career. He’s probably sick of being asked, “What happened?”…I watched this kid come in, and I was in awe. I was also frustrated. You see this kid who has this incredible talent. He made it look so easy. If he really wanted it and loved the game, he probably could have had one hell of a career. 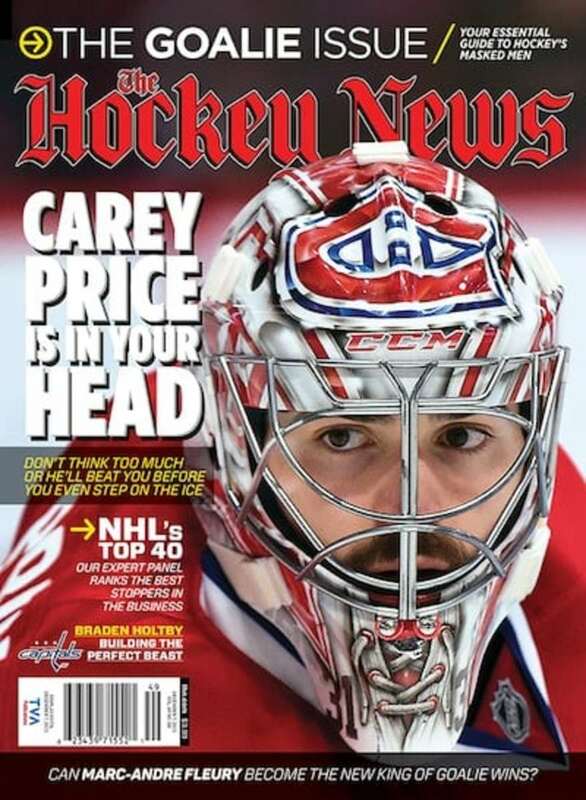 The Hockey News reached out to Carey for an interview, but he did not respond. This is an edited version of a feature that appeared in the December 7 edition of The Hockey News magazine. Get in-depth features like this one, and much more, by subscribing now.